Improve your Format sites chances of being indexed and increasing its ranking with search engines. You can edit your SEO titles and descriptions on a site-wide and per-page basis. SEO changes made within your Format site will not appear instantly in search results. It can take several days for the site to be re-indexed and updated. This shows how your website homepage may appear in search engine results. What visitors will see at the top of their browser window or tab and in search results. Include your name or business name or the main focus of what the site is about. To best optimize your page for search engines, provide a descriptive title up to 70 characters long. This is your Homepage description and will only be shown in search result. It will not appear on the page. Use a relevant description up to 250 characters long. Write in a way that is clear and easy to understand with relevant keywords. Example: Jane Dovercourt is a Toronto-based portrait and editorial photographer. With 15 years of portrait and editorial photography, Jane has never missed a beat. Add an SEO Page Title and Description specific to each page of your site. Tap 'Improve your SEO' to open the SEO Bulk Editor. Add your SEO Title and Description for each page. It should be specific to the content of the page. It will only be shown in search engine results. It will not be visible on your site. Enter a comma-delimited list of words which describe your website. This helps optimize your site’s search results. Use a comma ',' to separate words. Your keywords should be between 150-160 characters. Please note that Google does not use keywords for their search engine ranking, however keywords may be considered in search engines such as Yahoo and Bing. 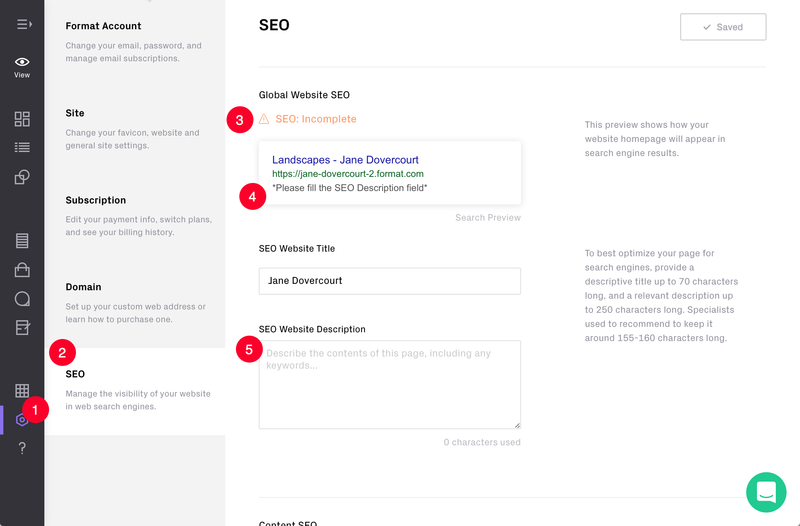 Your sitemap allows search engines to crawl the site more intelligently. A sitemap is an auto-generated file that lists the web pages of your site, telling Google and other search engines about the organization of your site content. View our guide for submitting a sitemap with Google Search Console here. 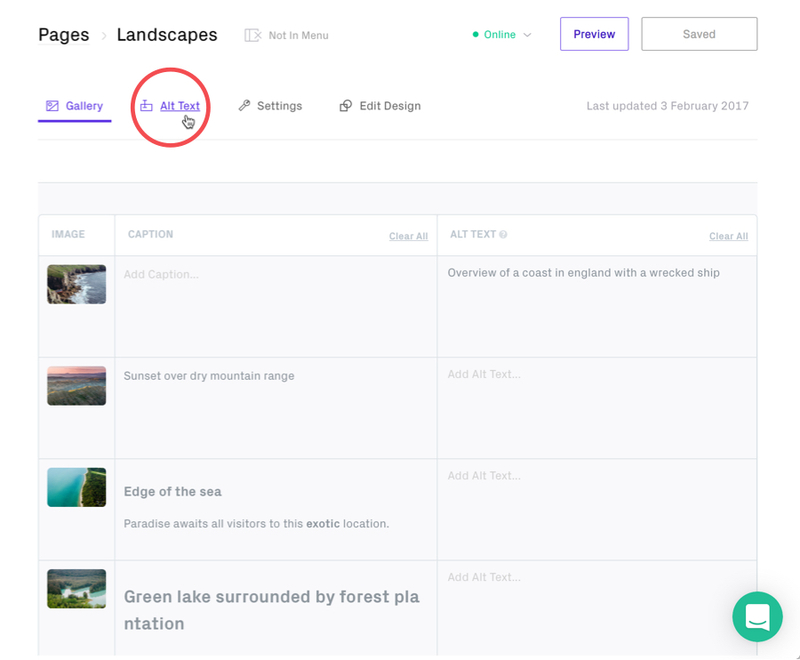 On Gallery Pages it is possible to add alt-text to your images, this helps increase your sites searchability and should be used to describe the image shown. When adding alt-text use words that people would use when searching but don't use keywords that don't relate to the image. Alt-text stands for 'alternative text'. Google chooses how to display your title as it pleases. Sometimes it will automatically create the title of the site in the order of "Brand Name: Title", even if you write it as "Title | Brand Name". The way it displays it can change depending on the search query entered. If you do a branded search query it's likely it will re-write it as "Brand Name: Title". A large amount of information is available for Search Engine Optimization online. Check regularly to see how your search engine optimization efforts are working. Try other words or combinations in an effort to improve results. There are many tools available but we find that Google Analytics will provide you with a comprehensive statistical overview of your Format portfolio site.